The world’s first full-scale atomic power plant devoted to the peaceful production of electricity was located 25 miles from Pittsburgh in Shippingport, PA. (The Walker Foundation was established in Pittsburgh where Foundation director Barrett Walker grew up.) Construction began in 1954, and the plant operated from 1957 to 1989. Having lived near the world’s first nuclear power plant, Barrett was particularly aware of the potential benefits and risks of nuclear power. Compared to coal-fired power plants, mines, and coal ash waste, he knew from experience that nuclear was much cleaner and safer. Knowing that nuclear was safe and clean, Barrett Walker was still concerned about the purported risks of nuclear waste, and running out of uranium fuel. Argonne National Laboratory developed and successfully operated a fast-neutron test reactor that recycled waste fuel and couldn’t melt down. Recycling the fuel has the potential to make nuclear power a sustainable source of energy with a nearly inexhaustible fuel supply. 1 The Integral Fast Reactor (IFR) was designed to recycle fuel that would otherwise be “tossed away”, enabling 100 times more of the energy in the uranium to be used, significantly reducing the amount of nuclear waste. 2 Unlike most of the world’s power reactors that operate with cooling water under high pressure, the IFR is cooled with liquid metal at close to atmospheric pressure, dramatically reducing the danger of a coolant loss accident. The use of sodium as a reactor core coolant eliminates the need for thick, steel containment vessels used at pressurized water reactors, but sodium has the disadvantage of being flammable if exposed to air. Although the scientists and engineers who ran the program thought they had solved the world’s energy problems while minimizing risks, the program was cancelled in 1994 for political reasons before a commercial scale reactor could be built. Experimental Reactor demonstrating recycling of fuel and high inherent safety. 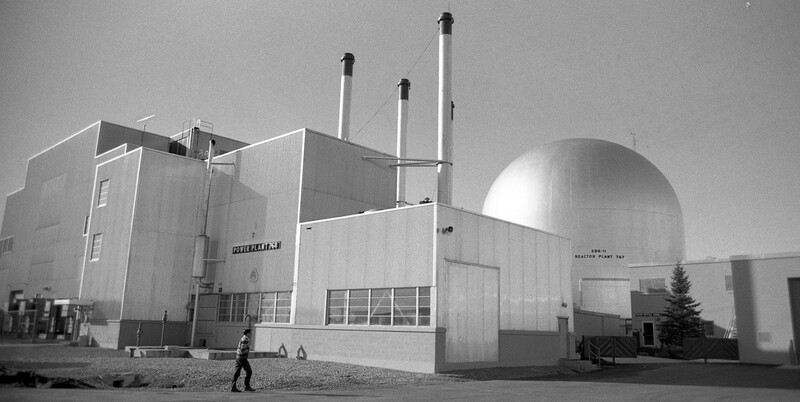 The EBR-II was a test reactor at the U.S. Dept. of Energy Argonne National Laboratory. This reactor demonstrated the Integral Fast Reactor concept, a nuclear power reactor that couldn’t melt down and recycled nuclear fuel for a sustainable future. In 1986 two tests simulated accidents involving loss of coolant flow, with shutdown devices disabled, the reactor shut itself down safely without overheating. The Foundation trustees understand from engineers involved in the project, that they thought this breakthrough reactor would solve the world’s energy and climate problems. For political reasons the program was cancelled, and a commercial-scale reactor developed by GE, called the Prism Reactor, was never built. Photo: Argonne National Labs. Terra Power is a nuclear design company founded by Bill Gates in 2006. 3 The company is building a large, newly designed power plant based on fast-neutron technology developed by U.S. government researchers. The reactor is fueled with depleted uranium and built to operate 40 to 60 years without refueling. Although designed in the U.S., the plant is being built in China, reportedly due to the difficulty of licensing a new design in the States. What about subsidies for nuclear power compared to wind and solar? A Foundation grantee, Environmental Progress, provided the following analysis. “In 2016, the latest year for which data is available, renewables received $10.7 billion more in federal subsidies than did nuclear, according to the Congressional Budget Office. That amount is 55 times greater than what nuclear received, measured on a per unit of energy basis.” Not only are renewables subsidized far more than nuclear power, many states have renewable energy standards that exclude nuclear power despite the fact that nuclear power is cleaner and safer. Federal funding of atomic research also launched the nuclear industry. Nuclear power doesn’t impose climate costs on society as do fossil fuels, including natural gas. Natural gas is artificially cheap compared to nuclear power because the market price of gas does not include its true costs. Gas industry safety regulations are far less stringent than for nuclear power, making natural gas artificially cheap. Two recent natural gas disasters in California. On the left: massive fire from the 2010 San Bruno pipeline explosion in a suburb of San Francisco. Eight people were killed and, according to local Mercury News, 38 homes destroyed. On the right: 2015 aerial footage taken by Environmental Defense Fund of the massive natural gas leak from a storage facility at Aliso Canyon, near Los Angeles. This image from an infrared camera recorded heat-absorbing natural gas (methane) as being black. The photo provides visual proof that methane is a potent greenhouse gas. “Accidents during drilling for oil and gas claim about a hundred lives a year in the United States. You’d think this would be big news.” * But the public hardly notices. By comparison, the most serious nuclear accident in the U.S., in 1979 at Three Mile Island, killed no one, yet the public fears nuclear energy far more. * Natural Gas and the New Deathprint for Energy, James Conca, Forbes, 1-25-2018. Although burning natural gas releases half as much carbon dioxide as burning coal, natural gas itself has a potent greenhouse effect. Natural gas is primarily composed of the chemical methane, and methane leaks from gas wells, pipelines, and power plants. Methane has 25 times the climate-warming effect of carbon dioxide. By comparison, nuclear power has very low lifecycle greenhouse emissions, even lower than solar PV. 6 Because the price of natural gas does not include the cost of damage to the environment. A tax on carbon would further allow nuclear power and renewables to compete on a level playing field. The World Nuclear Association carried out a review of over twenty studies assessing the greenhouse gas emissions produced by different forms of electricity generation. The results show that lifecycle greenhouse emissions from nuclear power are very low, even including the materials used to construct, operate, and decommission plants. Source: WNA Report: Comparison of Lifecycle Greenhouse Gas Emissions of Various Electricity Generation Sources, July, 2011. Political conservatives who advocate for free markets may wonder how the Walker Foundation can support the free enterprise system without opposing government-funded clean-energy research. The answer is that the economy benefits from investment in research and development (R&D) leading to scientific discoveries, new technology, and improved living standards. Economists widely recognize that R&D is an engine of growth for the economy. Because basic research has industry-wide benefits, firms tend to under-invest when they can not individually profit more than their competition. Firms also find it hard to raise sufficient capital for developing large-scale, longterm projects even though such projects have extensive benefits to society. Addressing climate change will require federal funding to spur research, development and deployment of clean energy. Deployment of new technology will require federal funding and loan guarantees. With only decades left to shift the economy from a reliance on fossil fuels to clean energy, the federal government will have to play a leading role. Example of government funding of nuclear power. In 2012, Foundation director, Barrett Walker, attended the World Energy Forum in the United Arab Emirates (UAE). At that time, the UAE planned to construct a solar plant and a much larger nuclear plant with four reactors. Barrett was amazed there was almost no interest from global attendees, or from the press, in the nuclear plant under construction. In March, 2018 the UAE announced that the first reactor at the Barakah Nuclear Plant was complete, with the 2nd and 3rd reactors nearing completion. The Abu Dhabi government and Export-Import Bank of Korea funded the 24 billion project. Photos: Left: Barrett Walker; Right Emirates Nuclear Energy Corporation. A wide array of projects — from the trans-continental railroad, to sewage treatment, to the space program, to new vaccines — were funded by the federal government working with private industry. Consequently, the Foundation views development and deployment of clean-energy alternatives to fossil fuels as deserving of federal funding. During World War II the United States funded atomic research in a race to beat the German Nazis who were developing an atomic bomb. After the war, “attention turned to harnessing this energy in a controlled fashion for for naval propulsion and for making electricity”. All nuclear power reactors in the U.S. are based on the design for the first atomic submarine. * Photo on left: Brochure showing the prototype reactor housed in a round metal tube simulating a submarine hull. Center: USS Nautilus, the first nuclear-powered submarine being welcomed to New York after the first under-ice, submerged cruise from Pacific to Atlantic. Right: Reactor vessel installation at the first commercial nuclear power station at Shippingport, near Pittsburgh, PA. The commercial power plant was built by Westinghouse based on the reactor the firm designed for the submarine Nautilus. Photos in the public domain. * Outline History of Nuclear Energy, World Nuclear Association. Recognizing the risks of climate change and the need for clean, baseload power, by 2018 entrepreneurs had launched 75 advanced nuclear projects in North America. Five companies are working with the Nuclear Regulatory Commission to prepare for licensing. 8 The main area of innovation is in small modular reactors that can be manufactured at a central facility and assembled on site. Almost all the large commercial reactors in the U.S. are of different designs and built on site. Manufactured according to standardized designs, modular components have the potential to cut costs while maintaining safety. But, according to leaders the Foundation had discussions with, innovation is slowed by having to comply with complex regulations designed to certify large nuclear plants. Federal support is very limited. The Foundation is interested in accelerating the development of new nuclear technology because of its role in reducing greenhouse emissions, while expanding access to electric power throughout the world. Climate scientists warn that time is short to avoid catastrophic outcomes from climate change. The longer we delay the higher the cost. Although the Federal government is subsidizing solar and wind power, there is only one remaining nuclear plant under construction in the U.S., Plant Vogtle in Georgia. China and Russia are actively building new nuclear power plants, and China in particular is innovating new designs. The U.S. risks losing its technological lead at a time when the world needs leadership to avoid the worst effects of the coming climate crisis. The Foundation is focusing on energy because any climate solution will require clean energy. Clean electric energy can replace reliance on oil for surface transportation. The current focus of car companies on shifting from gasoline and diesel to to battery-powered electric cars is an example. However, aviation requires power from high-density fuel. Batteries based on existing designs are far too heavy. Research into energy-dense biofuels is making progress. United Airlines reports being the first U.S. airline to use renewable biofuel for regularly scheduled flights, and the first to invest in a biofuels company, Fulcrum BioEnergy. 9 The aviation biofuel produced by Fulcrum uses municipal solid waste as a feedstock, not corn. Heat from the process is also used to generate electricity for the biofuels plant, further shrinking the carbon footprint of the fuel. United Airlines reports being the”first airline globally to fly on sustainable aviation fuel on an ongoing daily basis”. The fuel is supplied to the airline’s Los Angeles hub by AltAri Fuels from a retrofitted refinery in Paramount California. Evan Walker, son of Foundation director, Barrett Walker, is a United captain. Photo: United Sustainable Fuel Sources, from company website. There is another approach to making liquid fuel from captured carbon dioxide. Foundation director, Barrett Walker, first observed this process at a demonstration plant in Iceland. Waste carbon dioxide can be captured from the generation of geothermal energy, or from industrial processes, such as steel production. The captured CO2 is then chemically combined with hydrogen to produce methane (natural gas), or methanol (a liquid alcohol). 10 The conversion requires a huge amount of energy. But, having more nuclear plants with lowpriced, off-peak power at night could solve this problem and make carbon-neutral, liquid fuel for high-value uses, such as aviation. Industrial production is responsible for about a fourth of total U.S. emissions. Only a portion of industrial emissions will be reduced by a shift to clean energy sources. The source of carbon emissions hardest to address is the manufacture of concrete, steel, aluminum, and other industrial products. The most likely solutions are to capture emitted carbon dioxide and return it underground, or to recycle carbon dioxide as a chemical feedstock. Carbon capture and storage takes energy and is expensive, but is necessary to avoid runaway climate change. When faced with an incentive to recycle, companies have developed ways to use waste carbon dioxide as a feedstock for chemical manufacture. The Foundation has focused on the broad approach of taxing carbon, because a price on carbon benefits companies that develop less polluting and more sustainable industrial processes. Critics point to risks of carbon capture and storage, fearing that carbon dioxide pumped underground could later escape. Not only is CO2 a greenhouse gas, at higher concentrations it's also toxic to humans. The goal of carbon capture and storage is to minimize long-term risks compared to doing nothing. Again, Iceland leads the way in demonstrating a carbon capture project that converts the carbon dioxide into stone. The plant pumps carbon dioxide and hot water from a geothermal plant underground where it reacts with volcanic basalt rock. 11 Depleted gas wells have also been used for CO2 storage. Progress is being made in constructing buildings so they are far more energyefficient. Co-generation is the use of waste heat from the production of electrical power for heating and cooling. By building clean co-generation power plants close to where people live, waste heat that is currently dumped into the atmosphere, or ocean, could instead be utilized to heat and cool cities. A tax on carbon would incentivize research and deployment of all these technologies. Climate scientists tell us that we can still avoid the worst effects of climate change and ocean acidification. 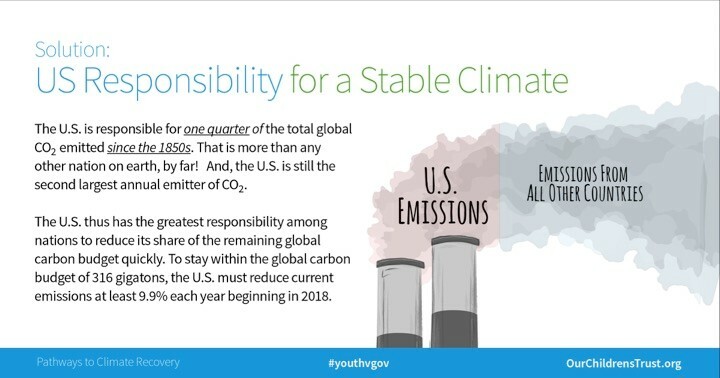 However, we’ve already released so much carbon dioxide into the atmosphere that the next generation will be burdened with the costs of drawing down carbon dioxide from over 400 ppm (.04% of atmosphere) to 350 ppm (.035%), a level exceeded three decades ago. 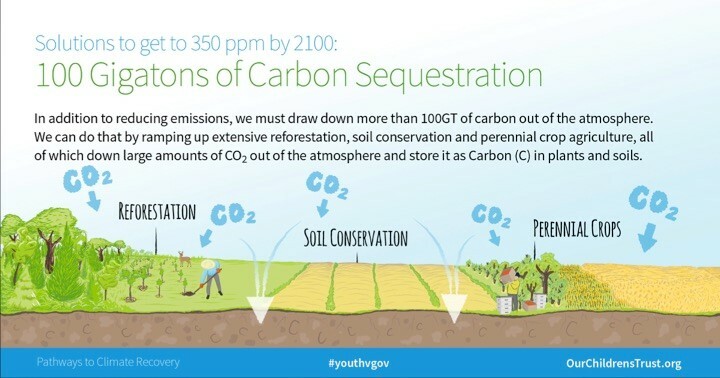 Reforestation with natural forests (as opposed to industrial tree plantations), and changed agricultural practices that store carbon in the soil, will help draw down carbon dioxide from the atmosphere. By acting now to address climate change, the United States can maintain its position of global leadership. Because the United States has the world’s largest economy, and the U.S. dollar is the world’s reserve currency, this country can play a commanding role in addressing climate change. If the U.S. passes a carbon tax that makes fossil fuels more expensive than clean energy, nations exporting to the U.S. will face a decision. Either pay the carbon tax to the U.S. government, or impose a carbon tax themselves and collect the revenue. The Foundation has funded economic research at Brookings Institution on how to best craft a carbon tax to make it effective and avoid unintended consequences. Reactors Designed by Argonne National Laboratory, Integral Fast Reactor. Recycling Used Nuclear Fuel for a Sustainable Future: Pyroprocessing Technologies, Argonne National Laboratory, U.S. Department of Energy, 2018. Fossil Fuel Risk Bonds: Safeguarding public finances from product life cycle risks of oil, gas, and coal, John Talberth, Ph.D., and Daphne Wysham, Center for Sustainable Economy, May, 2016. 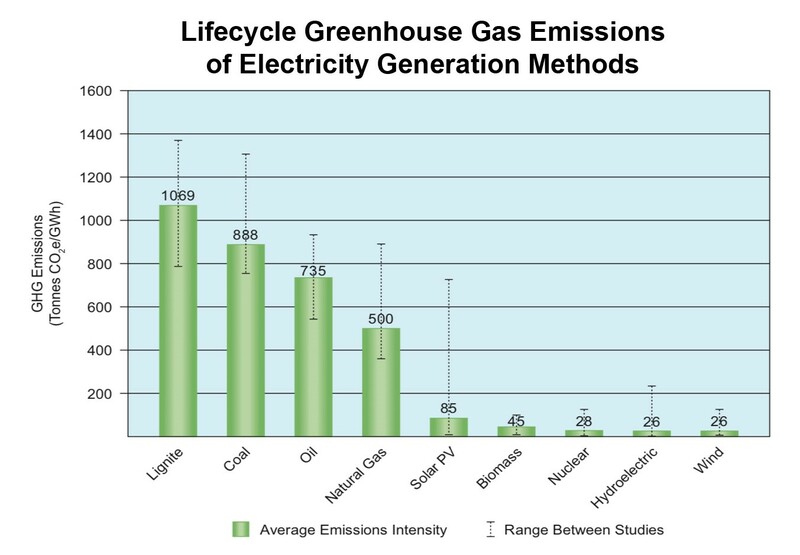 Comparison of Lifecycle Greenhouse Gas Emissions of Various Electricity Generation Sources. Navy’s Record Unblemished, Robert Farley, Politifact, 6-9-2008. Keeping Up with the Advanced Nuclear Industry, by John Milko, Ryan Fitzpatrick and Todd Allen, Third Way. Sustainable Fuel Sources, United Airlines, 2019. Bio-based News, CO2 is ready to go as a fuel and chemical feedstock, Nov. 21, 2013. Iceland Carbon Capture Project Quickly Converts Carbon Dioxide Into Stone, by Carl Zielinski, smithsonian.com, June 9, 2016. The Last Resort, by Richard Conniff, Scientific American, P. 52-59, Jan. 2019.